Replies: 19 (Who? ), Viewed: 13909 times. organization knows that there is a man who doesn't exist on the enemies is capable of dealing this madness, a 'Ghost', a 'Silent Assassin', The Hitman. -Create your Hitman (female/male doesn't matter)but if you are inspired like me you can also copy your hitman appearance like agent 47. -Your Hitman has no job/part-time job. -The traits of your HITMAN are Athletic, Brave, and Handy the other two depends on you. be bald and the female should be ponytail. -Cheats are not allowed except earning your cash from mission like the kaching cheat and the motherlode for creating your own hide-out/den. -The mod you will use to kill Sims is either ani's Dexter mod, Weapon System Mod or you can use nraas Master Controller Mod to kill it automatically(since my game version is 1.50 patch I used the 1.50 patch of nraas MC mod). Missions: (optional)The mission is set in the Sunset Valley. *you can create your own missions on the other neighborhoods or download the twallan's custom career mod if you are lazy on creating your own missions. Missions are not limited you can have it until mission 10 or even more. is part of the challenge..
Mission 1 - "Frio Brothers"
Mission 2 - "The Single Dude"
in the city, it's been reported that he also runs the prostitution in the hood. Mission 3 - "Big Bunch"
being a wrong side of justice. Mission 4 - "The Langraab Family"
to enhance their business by the time her son will be the next founder of this mafia family. Mission 5 - "The Alto Family"
Bridge port who sells also drugs..
Mission 6 - "The Goth Family"
and visions are madman, if he stay alive in the future the city will be doomed by his corrupt actions and prostitution. have to avoid the guards of the family, every Mafia family has their own body guards to protect them from guys like you. up to you how many will you create. and one of the bodyguards saw you and talk to you in the queue your out). Disguise is one of the most important ability of a hitman to make not noticeable by the target. -you can disguise your hitman by changing into your outfits. -If you use cheat in this challenge, game over. -If you did not complete the mission by 3 missed, game is over. -If you killed more than 3 civilians around, game is over. -You will win this challenge for reaching the last mission without any bad records from your client..
#3 8th Nov 2014 at 1:01 PM Last edited by MrDensilter : 9th Nov 2014 at 4:10 AM. Seems good! I just didn't got the bodyguard part... We place them on other's houses and if they talk to us we lose? #7 9th Nov 2014 at 10:45 AM Last edited by MrDensilter : 9th Nov 2014 at 11:22 PM. is there anyone still play this challenge?? This sounds interesting. Just downloaded Weapon System mod. Does one have to come and sneak into each house or can one shoot from a long distance using the rifle? anyone is up to this challenge!? any one still playing this challenge? I'm getting my game set up to try it. 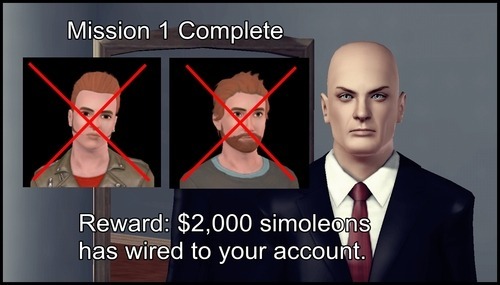 Nraas Careers also has an Assassination module that can be used to kill Sims. I created Billie Lurk from the Dishonored Video Game Series and plan to use her to do missions.